Cruising the food treasure-laden aisles of SM Hypermarket’s meat section today, I was delighted to see some good-looking cuts of lamb chops. The marbling looked awesome and it just had me grabbing some few slices for today’s meal. Now, what to do? The usual way would be smothering the lamb with mustard and rosemary or maybe coat it with some generous lather of yogurt and lime. However, some eureka moment prodded me to venture into something majorly diff. I knew I wanted something Morrocan, where spices burst and flavors play on the palate. Ahh, Moroccan rub was to be. Spices are used extensively in Moroccan food. While spices have been imported to Morocco for thousands of years, many ingredients, like saffron, mint olives, oranges and lemons are home-grown. Common spices include cinnamon, cumin, turmeric, ginger, pepper, paprika, anis seed, sesame seed, coriander, parsley, saffron and mint. My lamb went with a simple couscous fix and some few bunch of arugula leaves with cherry tomatoes and fresh apricots drizzled with some balsamic vinaegrette. Too stuffed, I felt too heavy to do the belly dancing afterwards. Oil chops with olive oil. Meantime, combine dry spices in a small container. Cover and shake to combine. 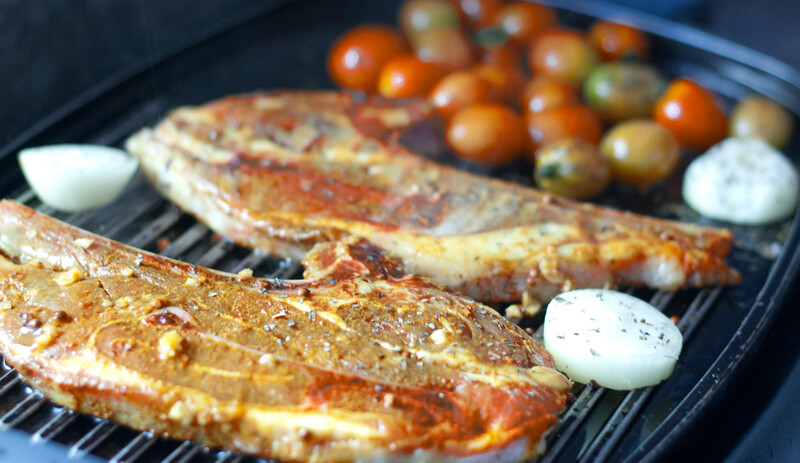 Rub spice blend into the chops on both sides. Seal in Ziploc bags and marinate overnight. Grill chops 7 to 8 minutes, turning once, for medium rare, 10 to 12 minutes for medium to medium well. Serve with wedges of lemon. Mix couscous, turmeric powder and cumin. Add hot chicken stock. Let it stay for ten minutes. Fluff couscous using a fork. Place chops on top of a bed of couscous on a plate when done. Toss all salad ingredients. Drizzle with balsamic vinaegrette dressing ( 5 tbsps balsamic vinegar, 5 tbsps olive oil, 3 tbsps honey, combined together). 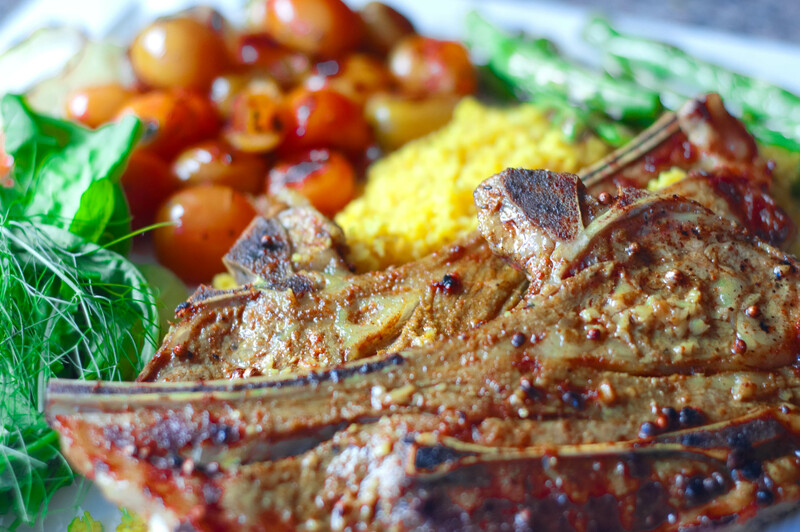 Wow, lamb chops! Looks good! Which hypermarket did you go to? Do they also have couscous there? Hey! I saw na the new SM Hypermarket at Centris Station. Tama kayo ni Jomie, ang ganda nga! sounds appetizing, my dear!! =) i can imagine how much more it tastes. to be sure, delightful to every bud!! happy valentine’s day, caren! maybe we can have post-valentine lunch dominated by ur lamb chops, since u already made me salivate hahaha =) btw, is there a hypermart within the area of commonwealth or katipunan? the nearest that i know from our place is at tiendesitas or sm north. i would want to try their lamb chops, ghinutom mo kasi tlg ako hehe 😉 thanks! @Faye, SM Hypermarkets near Commonwealth are Centris Station in Quezon Blvd, EDSA and SM City Fairview. If in Katipunan, you may visit Centris or SM Super Center Pasig. …will do this on the weekend. and comeback with the result.